I got several messages that I should point out a list of topics which a developer should know in wordpress to categorize him/her as a wordpress programmer. “WordPress Programmer” or “WordPress Developer” terms can be new to someone but due its popularity, term is getting attention and several companies are doing hiring based on wordpress experience only. 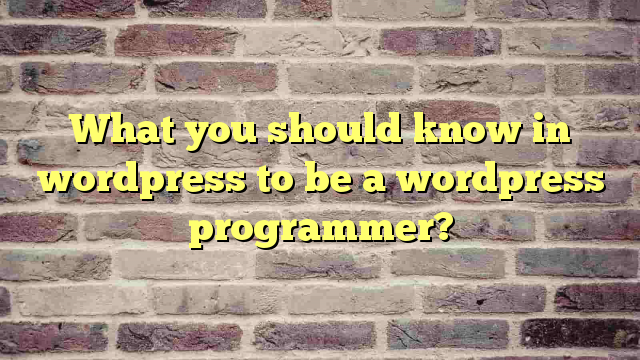 So in this post I am just enlisting some points which a wordpress programmer should know. How to edit config file of wordpress if needed? You should also know what normally can be edited? How to modify a them in wordpress? How you can create/use a different template for archive or category page? How you can use widgets? How you can create a plugin? How you can modify the content of a post or page? How you can add something before or after a post/page content? What are actions and how you can define callback functions on a particular action? How you can create admin menu using plugins? How you can edit the templates in online editor? How you can manage widgets? How you can manage users and thier different types? How you can disable/enable comments on a wordpress site or on a specific page or post? How you can use OPML files? How you can import RSS feeds? How you create custom meta tags in posts? How you can add specific attributes to any post or page? How you can mange user registration? How you can create private blogs or posts? At least 10-15 different plugins which can enhance/extend the basic wordpress functionality. How you can use caching in wordpress? How to take backup of wordpress posts using export?